Dobson and Robinson01943 608549work Shop - SportsDobson and Robinson is a family business which was established in 1916. The shop has been successful for over 97 years by giving a personal service in the areas within this site. As a member of Intersport the worlds largest sports retail organisation, we offer all the leading sports brands at the most competitive prices. We stock the equipment and clothing for all major sports and are particularly strong in cricket, football, hockey, rugby, tennis and swimming. Gift vouchers are also available to purchase. 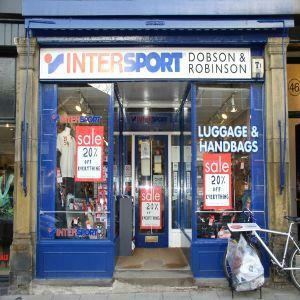 We also stock a wide selection of handbags and luggage.